It's time for our second feature event (a few hours early, I'm still too excited)! This one will have the regular amount of features from now on, two. The four stories featured in the last one will now be unstickied. Walking in a Wynter Wonderland... with twenty-six kids. Hoo boy. A: My first Sims game was TS1 for console, which I picked up after discovering the game on my cousin's computer. I was probably 12 or 13 at the time, so it was about... 2004. I upgraded to TS2 for PC about two years later, and here we are. Fast forward to 2013. I figured out that I could access all the old stories on the Exchange that I had missed by being young and not active on the internet. I read a chain of legacies that advertised each other by importing sims and simselves--Candi's "Uglacy", PurpleBunnySarah's "Piratical Legacy", and Professor Butters' "Goodytwoshoes Legacy", among others. Most of these also advertised Boolprop. I'd already heard rumors about it during my light internet activity, and finally went to go find it after I realized the legacy I was writing on the down-low could be publishing material. And Boolprop is such a great place--I only wish I'd found it sooner! A: Well, let's see. To pick one story specifically, I'd say "The Crowne Jewels" by nicholaplaysthesims. 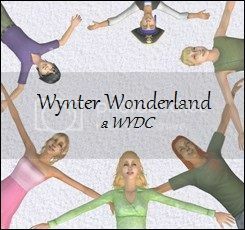 After completing my legacy, I was shopping around for a new challenge that would be shorter than a legacy and slightly more, well, challenging, and found Nichola's WYDC. It's a great one, by the way. After catching up on it, I read the other WYDCs published at Boolprop, and decided this is the one I would go for. I would say definitely Baby E, Eric. I was originally going to go with a far more obvious pirate motif with him, since he's the son of the pirate ghost, but he had his own plans for how his personality was going to run! Baby I, Ivan, is a close second, though, what with his rather amusing outlook on life and all. As for a favorite father? Probably... Rhys Fitzhugh. I don't tend to give a lot of air time to the fathers, but Rhys is a favorite character of mine, and of course a crowd favorite! He's awesome. Rourke Epic; bringing legacies together. Each heir will marry a sim from another legacy. 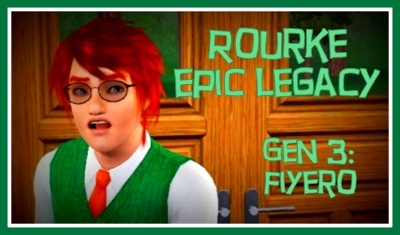 A Sims 3 EPIC: Click here to read! A: I've been playing on and off since the first iteration, though I'm not an early adopter; I've only just gotten heavily into TS3 this past year. A: Through Heather, writer of the Zale ISBI. A: I have probably read a hundred legacies, but my favourites and my inspiration are the Creepers, the Chimerees, Berry Crazy ISBI and the Zale ISBI. I'm not much into stories, rather a commentary style legacy/challenge. Q: What EPIC generation has been your favorite so far, and which are you most excited for? A: My favourite thus far is gen 2, since my heir has been a painter, and I've been enjoying all the different paintings she's creating. VINSON EPIC - Congratulations on being the FIRST to complete a Boolprop EPIC!